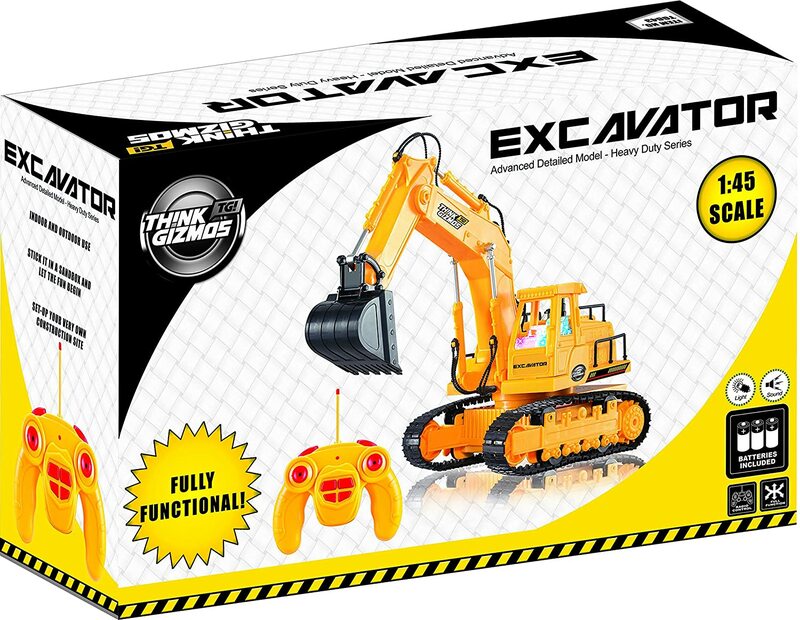 Introducing the Remote Control Excavator from ThinkGizmos. The next toy you buy for your children should be this as it will provide hours of fun. 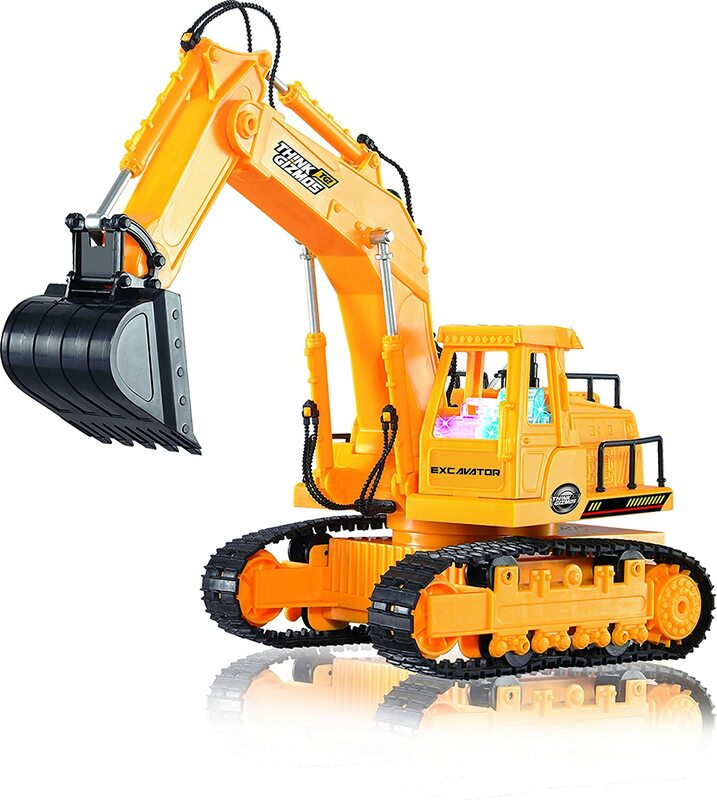 The Remote Control Excavator is designed to look just like the real thing. It is made to a 1:45 Scale and features realistic lights and sounds to add to the realism. It also features a cab which can rotate a massive 680 degrees just like the real thing and moving tracks so it can manoeuvre wherever it is needed. With a press of a button the RC Excavators scoop and arm will spring into action moving to dig or pickup whatever is in front of it. The best thing we found was to use this in a dry sand pit and then it’s like being on a real building site. With most electrical RC Toys, the issue with buying them is finding the right batteries or not having any spares at home. Well don’t worry as ThinkGizmos have got you covered. In the packaging for the Excavator is everything required to enjoy the toy, this includes all required batteries for the Excavator and the Remote. Also as a little added extra in the box a sheet of stickers is included so you can customise your Excavator just how you want it. Spy themed gadgets are awesome fun and according to the movies, can potentially save the World. As a result it is down to all of us to own at least one spy gadget in case saving the world comes down to us. Obviously if the gadget can provide some material benefit to us in the meantime, then it has to be a better choice. The Immortal Video Sunglasses are undeniably useful firstly because they help protect your eyes against harmful Ultraviolet rays and help you see clearly on bright, sunny days (we do get them occasionally). So that’s the useful function, what about the spy action? Well built into the bridge of the glasses is a tiny 3 megapixel video camera, allowing you to record what’s going on around you, capturing nefarious criminal activities, photograph blueprints or just take nifty pool party pics hands free. Featuring 4GB of internal memory, you can easily record plenty of video and the rechargeable battery will keep going for 2.5 hours between charges. With a head mounted video camera masquerading as sunglasses, it is also possible to capture footage of other more extreme activities such as skiing, mountain biking, snowboarding and sea fishing. And for the more fashion-conscious, the Immortal Sunglasses come with a selection of switchable coloured lenses (orange, polarized grey or clear) to match your outfit and a sturdy metal storage case for when you are not using them. When you get home, just connect your glasses to your PC using the supplied USB cable and pull the WMV video files off the internal storage for burning to CD or emailing to your mates. Or MI6 if you really are a spy of course. The Racing Car Kit comprises of 30 sections which are utilized to make and tweak an amazing Racing Car. It even incorporates an electric drill to aid construction. We as a whole realize that going out and finding batteries subsequent to acquiring a present can be a torment and fortunately ThinkGizmos have gotten ready for this so everything expected to appreciate the Construction Car Kit is incorporated into the box, including all required batteries. 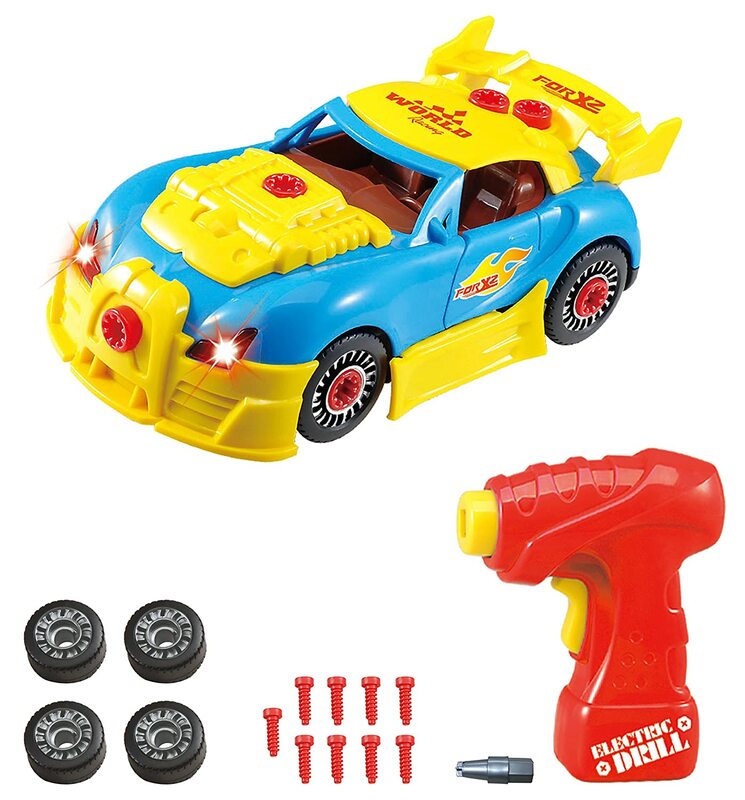 The Construction Racing Car Kit has included lights and sounds for authenticity and impact. Basically turn the motor on as with a genuine auto and it will start up. The auto can be disassembled and remade again and again which will likewise enhance fixation and discover hand aptitudes. The next time you find yourself needing a real espresso, but are in the unthinkable position of being less than 500 yards from a Seattle coffee shop, the Handpresso Wild Instant Espresso could be the answer. Despite the name, this coffee-making masterpiece uses real coffee grounds and a little bit of ingenuity to give you the perfect espresso, wherever you are. Pump the handle of the Handpresso Wild to create pressure and when the built in dial reads 16bar, open the unit, add an Easy Serving Espresso (ESE) pod and 50ml of water, press the button and out comes a perfect cup of espresso. Now with the Handpresso Wild Instant you can have a cup of finest espresso wherever and wherever you choose. Shaped like a short shiny black stick, topped with a clear water reservoir through which you can see the coffee-making magic take place, the Handpresso is like a wizard’s wand, dispensing a thick, authentic espresso within seconds. The compact nature of the Handpresso Wild means it can be taken anywhere and everywhere, fitting comfortably into a rucksack or briefcase. The Handpresso Wild Instant Espresso machine gives you a quick caffeine hit whenever, and wherever you want without having to track down a coffee shop, saving you both time and money. This espresso machine is also an eco-warriors dream, relying as it does on you to create the pressure required to make a cup of joe. Look Ma, no batteries! And because it is so simple to use, you will be making your own finest coffee in seconds, without the usual BA degree in fine art required to be a barista! Please note that the Handpresso does not heat or store water so you will need to take a thermos on your travels too. As the nights draw in, temperatures drop and Jack Frost begins to show his unfriendly face in the mornings, many a person begins to think about their Winter wardrobe. Coats, gloves, scarves and hats all come out of storage and the more geeky of us wonder why technology hasn’t manage to change clothes in the same way it has every other aspect of our lives. Why don’t we have more microchips in our clothing? The Wireless Sound Hat is the first step in rectifying that situation however. Looking like a normal black beanie, the Wireless Sound Hat boasts a pair of integrated headphone speakers stitched into the fabric itself; just pull the beanie down over your ears and you’re ready to go. Almost. Because first you must plug the magic wireless transmitter box into your iPod/iPhone/MP3 player using the affixed 3.5mm plug. Then press play on your music player, drop it and the receiver in your pocket or bag, and enjoy the tunes being streamed wirelessly into your ears by the hat. We don’t know exactly how it works, but the Wireless Sound Hat really does transmit music directly from your iPod without the use of wires. Available in two sizes, small and large, there is a Wireless Sound Hat for everyone, regardless of their head size. Could this be the reason The Edge (he of U2 fame) is always wearing a beanie…? So with the Wireless Sound Hat you get a cool item of headwear which integrates cool technology but which keeps you warm, if you know what we mean. Cool. And Warm. Cool! 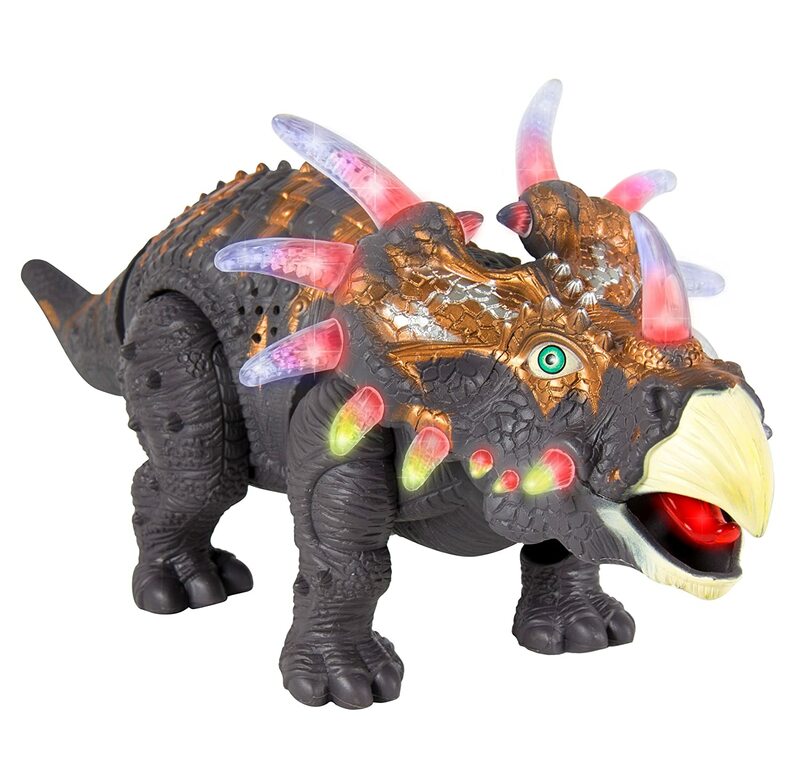 The awesome looking Triceratops Dinosaur makes the ideal gift for kids this Christmas and is available through Amazon here. The super looking Dinosaur features great roaring sounds and whilst walking around its horns flash. Everything you need to enjoy this Dinosaur is included in the box so just open it up and your Dinosaur is free to roam. Made from Non-Toxic Recyclable ABS Plastic which is durable and high quality making it the ideal addition to any play room. Also included in the manual is a fact sheet about the Triceratops so children can learn whilst they play, however if you would like to know more then further Dino information is available here.